Often close in quality to the same owner's top Saint Emilion, Le Tertre Roteboeuf. This Cotes de Bourg is head and shoulders the best wine of the appellation and very much a wine for those "in the know". A right bank wine, yet only 4 or 5 kilometres from Chateau Margaux as the crow flies. This vineyard is a south facing slope with well ventilated vines. The Cabernet Sauvignon vines here are over 50 years old. The 2017 Roc de Cambes, for a long time we considered changing the blend of Roc de Cambes by pulling up the Cabernet, but in the end we kept it the same blend as it is the character of the wine. This is matured in 100% new oak (although it is impossible to tell.) It has a very clean and pure bouquet, perfumed blackberry and bilberry fruit, a touch of seawater in the background. The oak here is nicely integrated. The palate is medium-bodied with slightly chalky tannin, notes of mulberry, blackberry, brine and touches of brown spice. Like the Domaine des Cambes there is fine energy in situ and it feels long and full of tension on the classy, quite peppery finish. Drink 2020-2035. 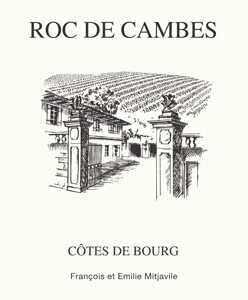 The 2017 Roc de Cambes is deep garnet-purple in color with a slightly reticent nose of blackberries, cassis and tar with nuances of pencil shavings, damp soil and dried herbs. The palate is medium-bodied, firm and grainy with great freshness and a long, lively finish. The 2017 Roc de Cambes exudes energy, tension and class. The presence of Cabernet Sauvignon is felt in the wine's aromatic and structural signatures. Black cherry, plum, savory herb, menthol, tobacco, graphite and licorice give the 2017 a rather somber personality. Even so, there is terrific freshness, verve and energy to the 2017, not to mention tons of sheer appeal. The blend is 80% Merlot, 15% Cabernet Sauvignon and 5% Cabernet Franc. Glowing dark crimson. A charry oak aroma is particularly noticeable in this vintage, at this moment in time, on L'Aurage and Tertre Roteboeuf from the same Mitjavile stable. Underneath the oak is dark fruit and silky tannins. Mouth-watering and fresh and I might have marked this down because of that seemingly heavy oak had I not seen how older vintages of this and Tertre Roteboeuf have aged. Drink 2023-2033. The yield in 2017 was 35 hl/ha, 80% Merlot and 20% Cabernets. A real contender for the best nose of the vintage, with sweet vanilla, wood smoke, truffles, summer pudding, and freshly picked blackberry. The palate follows, with oodles of black fruits exploding from a dense core, with supremely refined tannins offering a plush and generous mouthfeel. The spicy oak is sweet and meaty, with fresh black truffle complementing the exotic spices. The finish is long and smooth, with soft acidity offering just the right lift of freshness. This is a superb Roc de Cambes, and a unique expression of the vintage. The fruit is more intense than in Domaine de Cambes and it is more serious, more structured, more reticent and more regal. There is a dramatic edge to this wine which bring tannic tension and this warns the drinker away. While you can get on and drink the ‘wine from over the road’ this is a more tense creation and it will need 5 years or more. Having said this I like both wines equally which shows just how different in character they are.